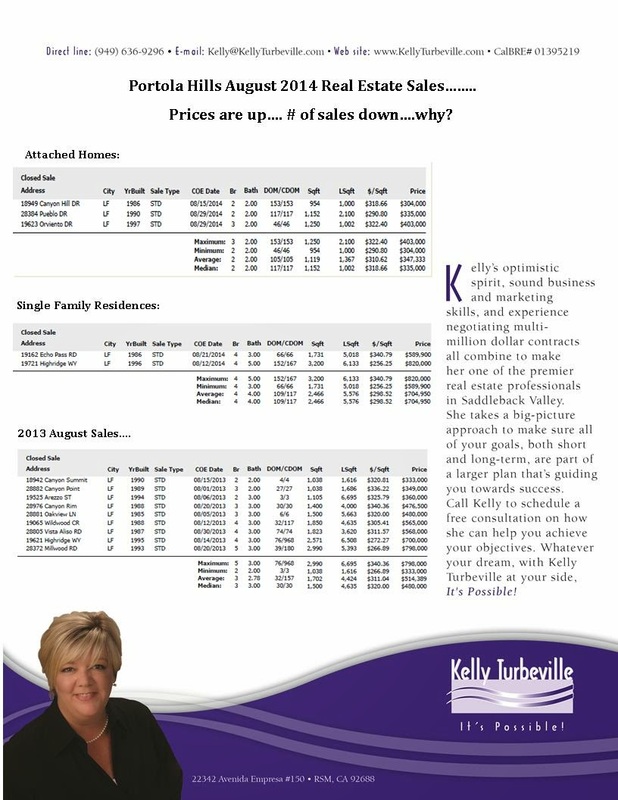 PORTOLA HILLS LIVING by Kelly Turbeville: August 2014 Portola Hills Real Estate Snapshot.. Prices up...# of Sales Down? August 2014 Portola Hills Real Estate Snapshot.. Prices up...# of Sales Down? Can you believe it... August is over and summer is wrapping up. Even though fall will be here in less then 20 days... the weather is still hot and kinda stagnant.. Which seems to be an accurate comparison to the Portola Hills Real Estate Market this month. In August the area saw a total of 5 homes sold compared to 9 homes sold in August of 2013. As you can see prices are up... about 22% over 2013, but so are the number of days on the market. Currently there are a total 25 homes active in Portola Hills with the average days on the market over 50. So did a 22% price increase scare off potential buyers... possibly as inventory increased so does selection, but what is really interesting is overall Orange County still has very low inventory rates... So you may be wondering why there is a slow down.... it's simple... Pricing and Marketing are all required to bring in the right buyer. As inventory increases, buyers are expecting to see competitive pricing from sellers and hopefully sellers should be seeing an increase in marketing activities from Agents. Now if your home is priced at fair market, show's beautifully and is marketed well.. it will sell and above fair market value.